Twenty years ago next month, Wham! 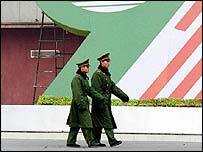 became the first Western pop group to perform in communist China. The story of how they got there is as entertaining as the gig itself. In April 1985, in the People's Gymnasium in Beijing, Wham! performed in front of 15,000 teenagers - as well as several members of the Chinese Government and press and TV crews from around the world. 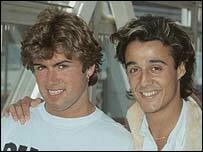 The group's manager, Simon Napier-Bell, had spent 18 months trying to get permission for Wham! to play. He believed the publicity surrounding the concert would turn them into international stars. Mr Napier-Bell has now written a book on the event, called I'm Coming To Take You To Lunch. He told BBC World Service's The Music Biz programme that the idea had come about following the band's insistence that they wanted to be the biggest group in the world within two years. "Biggest group in the world means biggest group in America - and you cannot do it in two years, it takes four or five to break, even when you're having constant number ones," said Mr Napier-Bell. "So we said, 'you can't do that,' and George said, 'no, that's it'. "Then Jazz (Summers, the group's co-manager) came up with the idea of perhaps we could make you the first ever group to play in communist China. George just liked the idea - he said, 'yes - fix that'." Mr Napier-Bell said that there was no pop music in China at all at the time, presenting a massive challenge when it came to selling the band to the authorities. He flew to Beijing, and spent a great deal of time in a hotel telephoning ministries in an effort to find someone who spoke English. He would a leave a message: "Tell them Simon Napier-Bell has called to take them to lunch." After three days, he got his first taker - the minister for energy - who had been expecting a coal buyer and confused his contacts. Mr Napier-Bell took him to lunch anyway. "It was two years of lunches - I fed the whole government, 143 people three times each," he said. He eventually persuaded the Chinese that in order to secure foreign investment, they needed to show they were opening up - and the best way to do this was to get a famous Western pop group to play in Beijing. "They had fallen for that," he added. "Also, I agreed instantly. Once they said yes, I didn't say 'in six months' time' - I said 'in two weeks'. "I think they might have backtracked, but they couldn't. The next morning it was in every single paper - tabloid and broadsheet - everywhere in the world." 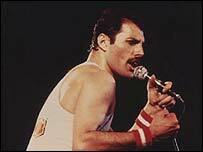 Napier-Bell also revealed that he had sabotaged the efforts of rock group Queen to be the first to play China. To prevent this happening, he made two brochures - one featuring Wham!fans as pleasant middle-class youngsters, and one portraying Queen frontman Freddie Mercury in typically flamboyant poses. The Chinese opted for Wham!. The gig may have been groundbreaking, but it was not a great show. A breakdancer had been hired to impress the crowd - but afraid his performance would not stimulate them for a full half an hour, Mr Napier-Bell instructed him to go into the crowd. "The powers that be were just horrified at this," he recalled. "In the interval, they announced on the loudspeaker that nobody could stand up, everyone had to sit down through the whole show - which was 100% my fault. I really killed the atmosphere." Further adding to the problems were the TV film crews, who had come to report on the audience and their reaction to the gig. The crowd on the lower levels mistook their cameras and lights for the secret police, and so sat rigid in their seats. "There were 7,500 people downstairs intimidated by the lights and the police standing around the outside, and upstairs you had 7,500 people getting more and more wild and crazy. "So it was a very strange atmosphere."